Lady likes to hop around the house. rides and loves to snuggle. 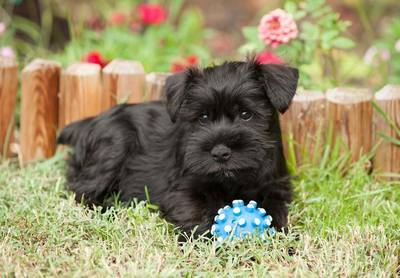 What are the different colors of Miniature Schnauzers? The standard colors for the Miniature Schnauzer in the Us are the salt & pepper, black & silver and black. This simply means these three colors are the only allowed colors that meet the breed standard for conformation showings. But, in Germany where the breed originated white is included in the breed standard. 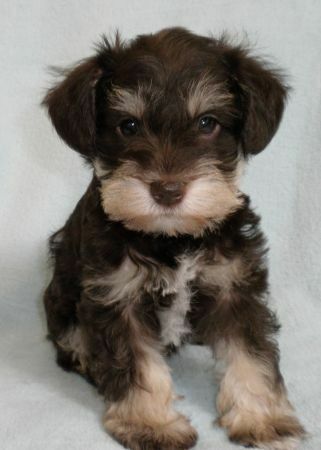 Today, Miniature Schnauzers come in a variety of colors from standard listed above to non-standard. The non-standard colors are: White, White Chocolate, Platinum Silver, Wheaten, Liver, Liver Parti, Liver Tan, Liver Pepper, Liver Tan Parti, Liver Pepper Parti, Salt & Pepper Parti, Platinum Salt & Pepper Parti, Black & Silver Parti, Black Parti and whats being called Phantom (and as time goes on I am sure there will be more). *Update*Colors 12/18: Red, Red Wheaten, Red Pepper, Red Parti, Wild Red Wheaten, Sable, Black & Rust and Liver & Rust. The Salt & Pepper is the most common color for the breed here in the US. In fact, when the breed was first registered in the US the Salt & Pepper was the only officially recognized color allowed. For those who are not familiar with the Salt & Pepper Schnauzer, they have many variations to their shade. 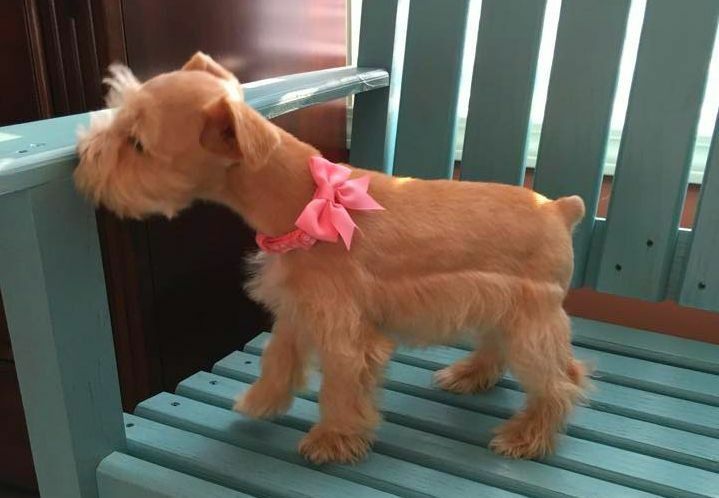 They can be born so dark you can mistake them for a black Schnauzer or they can be born so light they can be mistaken for a white Schnauzer. The lightest almost white looking Schnauzer is often called a "Platinum Silver" even though they are indeed a Salt & Pepper. 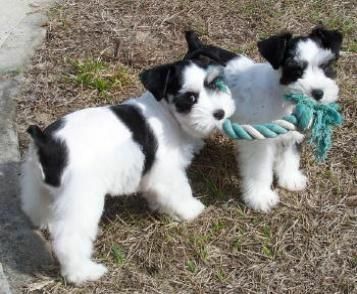 Salt & Pepper Schnauzers have what is called banded hairs, the hairs by their eyes have a banded appearance and describes the default color of the Schnauzer. When no other genes are at play, a banded color is the result. They often have pale tones to them, which rapidly disappear as they mature and fade out to light gray or silver white in the eyebrows, whiskers, cheeks, under the throat, inside ears, across chest, under tail, leg furnishings and inside the hind legs. The Black & Silver generally follows the same pattern as the Salt & Pepper. The entire salt & pepper section must be Black. The black color in the topcoat is a true rich color with a black undercoat. The stripped portion is free from any fading or brown tinge and underbody should be dark. The Black are a entirely solid black color with a black undercoat except they may have a small white patch on the chest. The Parti Pattern means that the base color is covered in large or small patches or white. The Black Parti is a black Schnauzer with patches of white. ​The Black & Silver Parti will have distinct white eyebrows and muzzle and other distinct markings in the absence of the parti marking covering that part of the body. The Salt & Pepper Parti is a Salt & Pepper with patches of white and will have the banded hairs. 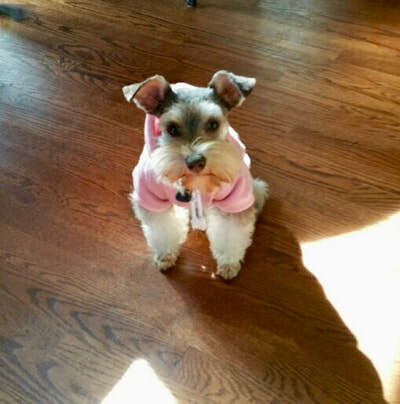 The Liver is a Schnauzer with a brown based body, nose, eye rims, lips and paw pads with green or hazel colored eyes. 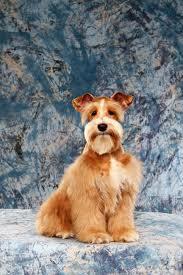 (In Some Liver Schnauzers the chocolate brown coat will lighten as they age). The Liver & Tan follows the same as the black & silver because it is the recessive color. The Liver Parti is a chocolate Schnauzer with patches of white. The Liver Pepper is a chocolate Schnauzer that has Liver peppers (banded hairs) of liver/brown that always fade to a lighter liver as adults. They will have brown or green eyes, brown nose, lips, pads, eye rims and pads. 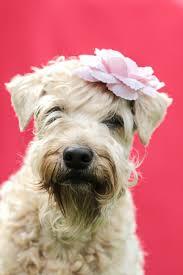 The Wheaten has a yellow, cream or red coloring of the coat and have a yellow strip down the top-line of the back. They can either be black based or brown based. The White is not an albino, Albinos have pink noses as adults which is a lack of pigmentation. They are born solid white and will have black nose, pads, eye rims, lips, silver/black tinted skin tone and black eyes. The White Chocolate (Liver) is a white schnauzer with brown nose, pads, eye rims, lips, pink hue to their skin and brown or green eyes. 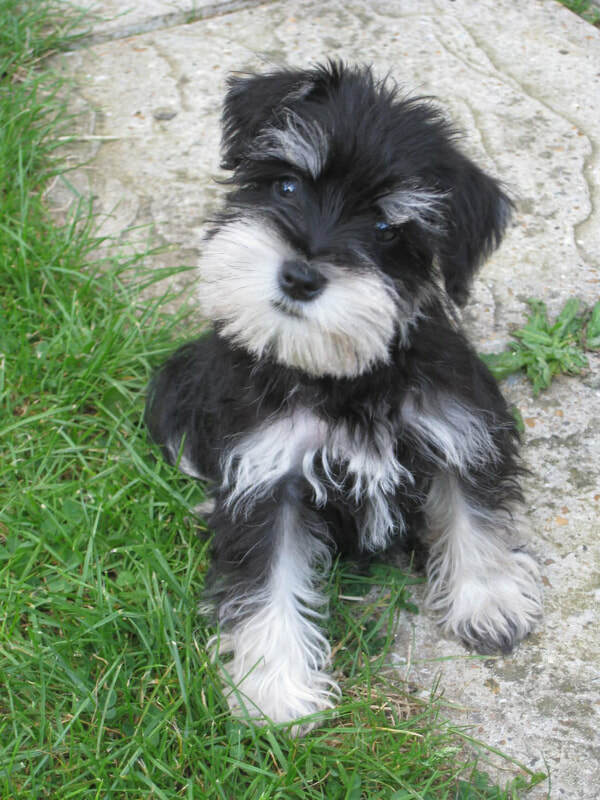 The Phantom is a black and silver Schnauzer that has a very strong contrast between its black and silver colorings. *Note* not all black and silver Schnauzers are phantoms, but all phantoms are black and silver. 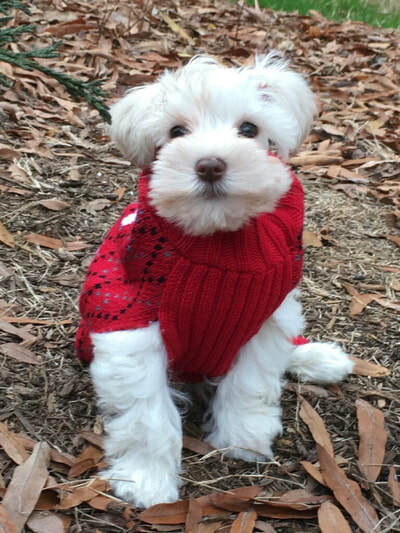 The Red come in three shades of red – dark, medium, and light and peppered, parti, wheaten and sable. What is a Merle? The Merle pictured is a (gene) pattern in a dog's coat, though is commonly incorrectly referred to as a color. The merle creates mottled patches of color in a solid or piebald coat, blue or odd-colored eyes, and can affect skin pigment as well. Health issues are more typical and more severe when two merles are bred together. Merle gene can affect all coat colors. In addition to altering base coat color, the merle gene also modifies eye color and coloring of the nose and paw pads. The merle modifies the dark pigment in the eyes, to blue or part of the eye to be colored blue. This pattern should not be added to any other dog breeds. It is a risky and dangerous mutated gene. The approved breeds listed below should be the only breeds to have this pattern and those breeders need to do their due diligence to safely work with this gene. Those breeders should also test for eye and hearing issues and proceed with caution. This pattern is banned in many countries and it has nothing to do with the color/pattern but the health of the breed. Merle is a distinguishing marking of several breeds, particularly the Australian Shepherd, and appears in other breeds, including the Koolie, German Coolies in Australia, Shetland sheepdog, various Collies, Welsh Corgi (cardigan), Pyrenean Shepherd, Bergamasco Sheepdog, Old English Sheepdog, and Catahoula Leopard. In Dachshunds the merle marking is known as "dapple". It is also present in the Pomeranian and Chihuahua, but is a disqualification according to the FCI Standards. The merle gene also plays a part in producing harlequin Great Danes. In several breeds, such as the Pomeranian, Chihuahua, Schnauzer merle is an indicator of cross breeding. Gizmo as a puppy Ex: of what a Blanketed Parti looks like. ​We breed for the rich shades of Liver (chocolate) the color is so rich it may appear to be black, as well as, for the unique patterns in our parti's that have heavy ticking. What we refer to as the "Blanketed Parti" ​(pictured) and "Saddleback Parti". The term is used to describe large splotches of color on the topline of the dog, which resembles a blanket or a saddle. They can have larger placement and in others smaller saddles. Colors can very from the very dark liver (which is what we prefer to produce) to reddish liver or as light as to appear white, the white chocolate. These examples of the different color Schnauzer are not our dogs. These examples of phantom, white chocolate and liver are dogs from a breeder friend of mine, Rene.